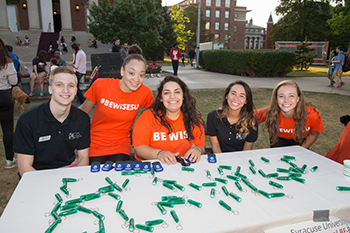 The BE Wise campaign is kicking off its year-long campaign at the fifth annual BE-BQ event this Friday, Sept. 23, from 6-9 p.m. on the Quad. The campaign strives to generate awareness of alcohol poisoning, how to avoid it, its signs and how to respond to it. The BE-BQ is free and open to all students. There will be barbecue food, lawn activities, open volleyball and music courtesy of DJ Victor Suarez ’15 at the event. The award-winning BE Wise campaign began in spring 2013 as a way to build awareness of alcohol poisoning at Syracuse University. Its goal is to creatively engage students and equip them with the knowledge to make safer decisions about drinking. BE Wise peer educators, in conjunction with the Newhouse-based student public relations firm Hill Communications, work with staff from the Counseling Center and Office of Health Promotion to provide social marketing, educational presentations and outreach to increase awareness about alcohol use and alcohol poisoning. There are three central pillars to the BE Wise campaign: BE Real and know your limits; BE There and make the call when someone is in need of help; and BE Aware by knowing the signs of alcohol poisoning. The campaign uses the acronym C.U.P.S to remind students of the signs: cold skin, unresponsiveness, puking and slow breathing. For more information on the BE Wise campaign, visit the BE Wise website or follow the campaign on Facebook or Twitter. For questions, to schedule a BE Wise training or inquiries about integrating the campaign into existing programs and curriculum, contact subewise@syr.edu.